Prime Minister Justin Trudeau has invited the Markham Thunder women’s hockey team to Parliament Hill to celebrate its Canadian championship this year. It marks the first time the Clarkson Cup champions have been invited to visit a Canadian prime minister after winning the league title. Prime Minister Justin Trudeau has invited the Markham Thunder women's hockey team to Parliament Hill to celebrate its Canadian championship this year. It marks the first time the Clarkson Cup champions have been invited to visit a Canadian prime minister after winning the league title. Thunder general manager Chelsea Purcell knew there were rumblings in April about the potential of the visit happening after they won, but didn't believe it would come to fruition. Now, the Markham Thunder will triumphantly head to Ottawa on June 4 to meet with Trudeau. "I was shocked," Purcell said. "I got a call Wednesday night confirming it's going to happen. The team is so excited. Most are doing what they can to be there but it won't be possible for the entire team to attend with work and prior commitments." The Markham Thunder captured their first-ever title on March 25 when they defeated the Kunlun Red Star 2-1 in overtime. 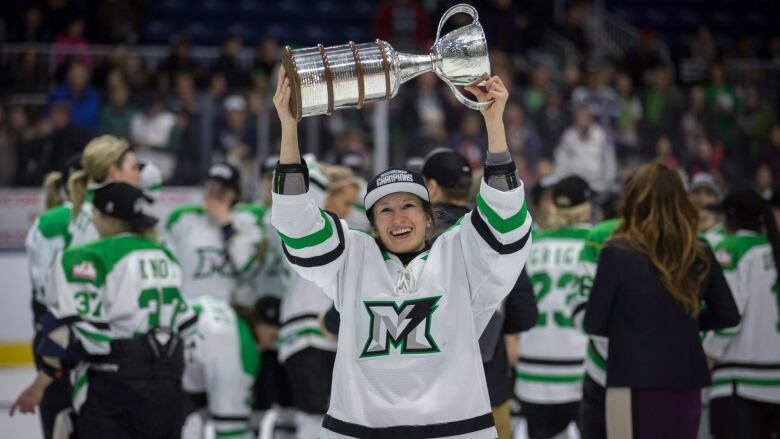 Laura Stacey scored the overtime winner to capture the Clarkson Cup at Ricoh Coliseum. The Thunder, who relocated from Brampton to Markham for this season, upset 2017 Clarkson Cup champion Montreal, sweeping their best-of-three semifinal to advance to the championship game. Purcell, who was named the first-ever captain of Alberta's CWHL team, said meeting with Trudeau will help continue to grow the sport. "This is very big of Trudeau to do, to step up and show the support around women's sports. It's been a while since a Canadian team has won in the NHL so they probably aren't used to inviting the champions to the Hill," she said. "I think this is a big step for women's hockey and will help give us some amazing exposure." The CWHL was established in 2007 and currently has seven teams in the league — four teams from Canada, two from China and one from the United States. However, this was just the first year for the league where players were paid a stipend to play. Purcell said there is still room for improvement but they are trending in the right direction. NHL commissioner Gary Bettman has made suggestions in the past that there could potentially be a Women's National Hockey League one day, something Purcell supports. "We want it to be Olympic calibre every year so more people will watch," Purcell said. "It's our hope one day young girls will dream of playing in the WNHL." It was a dream season for Markham now capped off with a trip to the nation's capital to be congratulated by Canada's prime minister. "Everything came together when it needed to," Purcell said. "Everyone bought in and it couldn't have ended any better."